Mammoth Sierra Townhomes is conveniently located only a short distance to the lifts, shuttle routes, local shops, and restaurants. 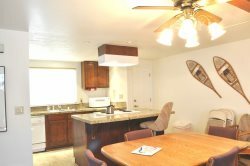 This Mammoth Sierra Townhomes Mammoth Lakes condo is newly remodeled with granite countertops in the kitchen, beautifully tiled bathrooms, new furnishings, appliances, and much more. There are two bedrooms plus a loft, 3 full bathrooms, and large open family room, supporting this spacious condo which comfortably accommodates up to 10 guests. There is a king size bed in the first bedroom downstairs with its own full private bath. The second bedroom downstairs has a queen size bed with its own full private bath also attached. The living room, kitchen, dining room, and third full bathroom are all located on the second level with plenty of space for everyone. The loft located above the living room has a full size bed as well as two twin beds. There is an additional pull out sofa sleeper in the living room that can accommodate two more guests. This Mammoth Sierra Townhomes condo has a wood burning stove in the living room to keep the home warm, as well as private balcony, shared spa on-site, and swimming pool (summer months only).